Kandra Clark is the associate vice president of Exodus Transitional Community. Photo courtesy of Kandra Clark. In recent days, New York City began its public review to close Rikers and open a network of borough-based jails. I won’t guess at how my community board or borough president will vote, but based on what I have seen in print recently we know there are concerns. The outcry, however, does not reflect the breadth of views that I have heard as a resident of Forest Hills. Among my neighbors, there is everything from hardened opposition to full-throated support for a local jail and the closure of Rikers Island. Forest Hills is not a neighborhood where we opine in silence. We know each other’s names. We buy lemonade from our neighbors’ children. In the shops, the local proprietors know how we take our coffee. I have spoken to my friends in the elevator, in the halls, on the street and among my community of dog owners in Austin Park. There is definitely opposition. But there is also compassion. There is flexibility and there is support. 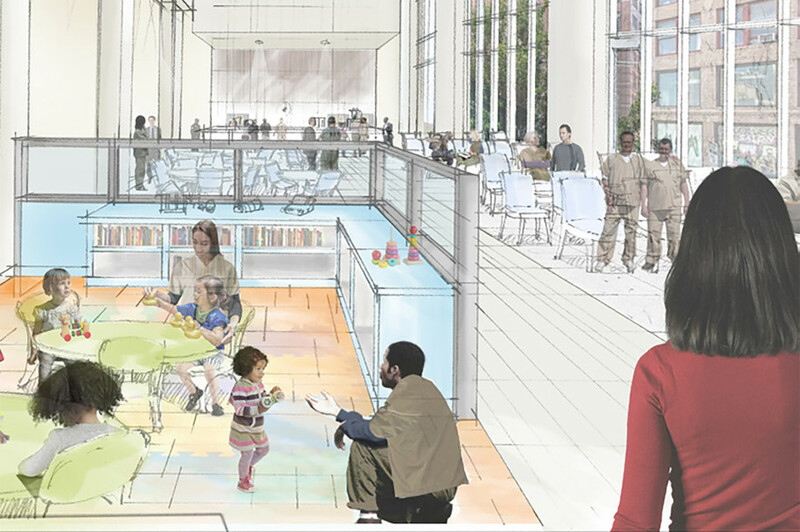 The proposed Kew Gardens jail would include family meeting space. Image via the Mayor’s Office. After one particularly difficult meeting — where I was stung by stigmatizing language against justice-involved people — I was shaken and visibly upset. A friend and neighbor stopped me on the street to offer comfort, incredulously asking how anyone could question the moral imperative of closing Rikers. I have received private words of encouragement from local residents who have had justice-involved family members. Like me, they believe that our justice system can and must do better. Among those opposed, perhaps I’ve changed a few minds. For example, I had a heated debate about the community-based jail with one of my neighbors, who is also a close friend. I like to think our friendly argument was settled when she conceded that we, as taxpayers, are all complicit in the existing system’s abuses unless we act. Maybe she agreed. Maybe she was humoring me. But my only point is that our views are not monolithic. I live in Forest Hills and my own opinions are about as strong as they come. As a formerly incarcerated woman who now works to reduce the number of people in jail, I believe that we must close Rikers, that we can shrink the jail population to a fraction of its current size and that we should put jails closer to families, public transportation and courts. The future jail should look nothing like what now exists. There should be light, dedicated visiting space that fosters connection and ample programmatic space for vocational, therapeutic and other services for people in custody. It should not be the grim, fortress-like structure that now looms over the area but rather blended into the surroundings with design features that make it more attractive to pedestrians. In the end, I also believe that my neighborhood is an appropriate place for a modern, humane jail. Moreover, I know that many of my neighbors agree. Kandra Clark is the associate vice president of Exodus Transitional Community, an organization that provides services for people leaving prison.